When you think about “stem cells,” you probably think of the controversial embryonic stems cells that have the ability to fight disease by regenerating failing organs. But did you know we have stem cells all over our body? Stem cells are constantly regenerating themselves on the surface of our skin when we slough the old cells off. As we age, our stem cells weaken from years of sun damage, environmental pollutants and other factors. This makes it harder for the stem cells to repair skin tissues and regenerate when needed. If you’ve ever noticed a baby’s soft, glowing skin…you’ve seen the perfect example of fresh new stem cells hard at work. Over the years, our stem cells begin to require a little help. That’s where plants come in! Plants actually have their very own set of stem cells that help to regenerate and repair the plant when needed. How can plant-derived stem cells really help human skin, you ask? Plant-derived stem cells are thought to be even stronger than skin stem cells in order to withstand the harsh conditions around them. The same way they help protect and repair plants, they can help protect our own stem cells and prevent aging! Plant-derived stem cells combat dryness, sun damage and fine lines by restructuring and renewing the epidermis. 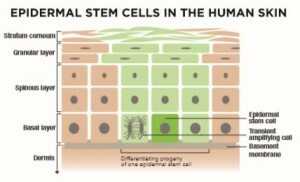 IMAGE Skincare uses plant-derived stem cells in many of their products. Pre-Order your NEW The MAX Stem Cell Serum for unsurpassed preventive measures against the aging effects on the skin!